If you think you may have sleep apnea, visit our Mountainside, NJ office and let Dr. Robert Wortzel determine what treatment is needed. Without it, you could risk losing more than a restful night's sleep. Anyone can develop sleep apnea, but it is more common among middle-aged adults who are overweight. Dr. Robert Wortzel can help you determine the cause and suggest positive treatment. 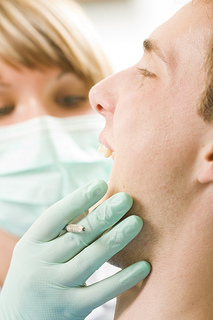 A common treatment for apnea is the placement of oral devices that are designed to help keep the airway open. By bringing the jaw forward, the device opens the airway and thereby discourages snoring. We are experienced in sleep apnea appliances, and Dr. Robert Wortzel can prescribe a fitted device and monitor its success with follow-up therapy. Our professionals at Integrative Dental Care can advise you of other ways to prevent sleep apnea, including weight loss, avoiding alcohol, or alternative sleeping positions. We can help you sleep return to easy sleep, knowing you are safer and healthier during your resting hours.